The ideational turn in new institutionalism is by far the most recent and has the potential to examine public policy decisions regardless of political, societal, and socioeconomic conditions. 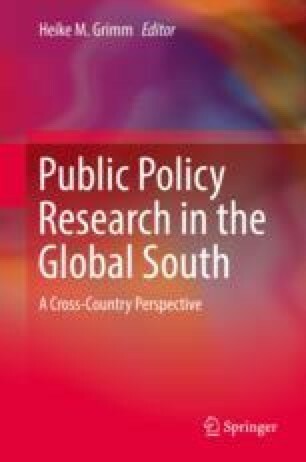 Recent theoretical advancements in ideational institutionalism have built enough foundation on which institutional analysis could be sufficiently carried out in countries of the Global South that do not necessarily present facets of pluralistic societies or of well-established liberal democracies. This introductory chapter advances theoretical application of ideational institutionalism by building conceptual clarity on types of ideas, their origin, and the mechanism through which they affect public policy outcomes. It builds further on the existing institutional scholarship and presents an ideational framework of public policy for understanding the mechanism through which ideas originate and affect public policy outcomes. The framework allows categorization of different types of ideas as per their influence on the policy process and its outcomes. The framework rests on discursive means and practices that are originated and constituted by “text,” ‘agency,” and the “structural context” and result in the construction of ideas. This forms the basis for policy deliberations and decisions, central to how policy makers conceive and evaluate their options and how and what they decide. It is contended that ideational institutionalism has the capacity to inform an endogenous account of complex institutional evolution, continuation, adaptation, and innovation.